Walkers heading up Wales’s highest mountain will be offered safety advice from a new mobile service. The Welsh Government has funded an information van to help visitors planning to ascend Snowdon. The innovation is part of the Mountain Safe project, aimed at educating the public on how to enjoy the national park’s mountains safely. Snowdonia National Park Authority, which is a partner in Mountain Safe, said the van will provide information on Snowdon’s paths, as well as alternative walking routes in the area. A small supply of maps will also be on sale. The exhibition was developed by the authority, and rooftop solar panels enable the use of touch-screen technology providing access to its website as well as other important information such as weather forecasts and public transport timetables. 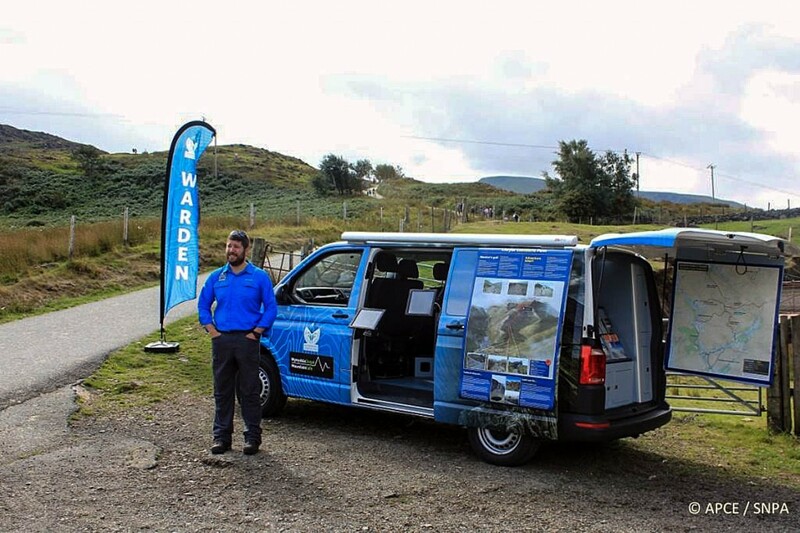 The van will mostly make an appearance on weekends, but with the help of the Snowdon voluntary wardens the van may also make its rounds during the week, the national park authority said. Adam Daniel, senior warden for the North of the national park who led the project, said: “One of the challenges facing us wardens is reaching and advising as many as possible of the individuals who venture up Snowdon every day. “While we have a warden present at Pen y Pass daily during the peak season, it is very difficult to reach walkers on other paths. The Llanberis Path is especially busy; therefore by locating the van at the bottom of this path we hope to be able to advise as many walkers as possible to try and ensure that they have the best possible experience on Snowdon”. The authority said the next stage is to develop information for the Cadair Idris paths so the van can visit the South of the park occasionally, as well as a general exhibition for use when the van is taken to various events or shows across the park. An excellent initiative. The national park wardens in Spain's Sierra Nevada have been running a similar project for several years and it has saved a few folk getting into trouble because they were ill-equipped or inexperienced. Something to consider for the likes of Helvellyn, Scafell Pike and Blencathra (Sharp Edge) ? Wish they had thought of this before my father fell of it and died! Every little helps but they won't capture many folk using this method. Wonder what might happen when a group is advised to take a different route but carries on with their original plan. They have a problem - then claim the adviser should have 'stopped' them taking that route, not just advised against it. Yes, a bit far fetched, but the public are a strange bunch. Ian512 (smith). That may not be not as far fetched as you suggest. What if they did take the alternative suggestion and someone had an accident. In some people's opinion the only person to blame would be the guy who suggested the different route. Where there's blame (in some people's mind) there's a claim. Snowdon used to have loads of wardens that would be out every weekend covering all of the paths. You never see a warden on snowdon anymore, and the rescue team are out every day of the week doing the wardens job for them. Parking one warden at the bottom of one path is going to make no difference, lip service to hide the scaling back of wardens jobs.